The tremendously successful "Ghost Rider" arc may have come to a close, but we still have another half-season of Agents of S.H.I.E.L.D. to go! "Coulson and Mack discover a shocking secret about Mace, which leaves all of S.H.I.E.L.D. in a dangerous position. Guests: Jason O’Mara, Mallory Jansen, Adrian Pasdar, Maximilian Osinski, Patrick Cavanaugh, Troy Caylak, Kimberley Drummond, Shelly Robertson, Alastair Bayardo"
The character of Jeffrey Mace was actually created back in the 1940s; the comic book version was a reporter for the Daily Bugle who fought crime and Nazi spies. Into the 1970s, #Marvel revisited the concept and revealed that - in the decades when Steve Rogers was lost in the ice - Mace took up the mantle of Captain America! Tragically, he was diagnosed with cancer, and ultimately died with his hero, Steve Rogers, at his side. The character has been massively redesigned for Agents of S.H.I.E.L.D.. For one thing, he's an Inhuman, whose Inhuman powers were triggered by exposure to Terrigen. In the #MCU, Jeffrey Mace was a political journalist for International Affairs who was on-hand for Zemo's terrorist attack on the signing of the Sokovia Accords. Mace became something of a hero for his actions in the aftermath of the bombings in Vienna, as he worked to save lives. Off the back of this demonstrated heroism, and with the political connections he'd built up as a journalist, the President felt he was a wise choice to take over as head of S.H.I.E.L.D.. But Agents of S.H.I.E.L.D. has already given us hints that Mace has a dirty secret. Elizabeth Henstridge's Jemma Simmons called him out on lying about events in Vienna, and as a result she's been exempted from the routine lie-detector tests she used to go through. Whatever Mace's secret, the very idea of Simmons being aware of it shook him to the core. Now we learn that his secret has the potential to do real damage to S.H.I.E.L.D.. The problem is compounded, though, by the episode synopsis revealing that Coulson and Mack uncover this secret. Season 4 has shown Coulson struggle to accept the new limits of his authority, now he's no longer Director of S.H.I.E.L.D.. With both Daisy Johnson and Ghost Rider, he made decisions that put the whole of S.H.I.E.L.D. at risk - largely because he didn't trust Mace, and didn't want to get caught up in bureaucracy. Coulson trusts his instincts, and those instincts continue to tell him to take charge. Added to this, we've also learned that - although Coulson wanted an Inhuman in charge of S.H.I.E.L.D. - Jeffrey Mace wasn't his choice. He wanted Chloe Bennet's Daisy Johnson to take his place! Now Daisy's back in S.H.I.E.L.D. (and been granted a mysterious 'Blue' clearance level), his conflicted loyalties are sure to come to the fore. Especially if, in his view, Mace's secret means he should never have been in charge of S.H.I.E.L.D. in the first place. The question is, will Jeffrey Mace suit up as the Patriot? We saw him take on a costume of sorts in the mid-season finale, but will he embrace the identity of the Patriot? It's possible, and I can't help wondering if he'd already acquired his Inhuman powers before Vienna. In that scenario, perhaps he'd already become a superpowered vigilante, and was on hand for the signing of the Sokovia Accords because he knew they applied to the so-called 'Patriot' as well! My instinct is that the episode will show us flashbacks - including one with Adrian Pasdar's Glenn Talbot talking to Mace about S.H.I.E.L.D.. 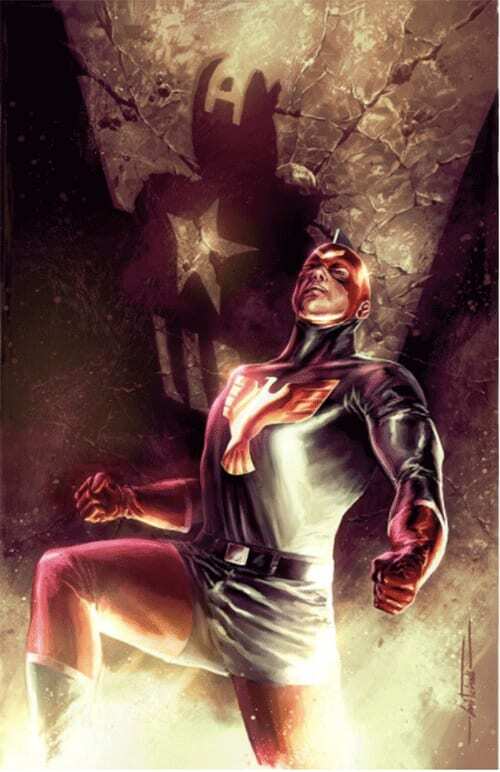 These flashbacks will reveal the secret behind Jeffrey Mace, and perhaps even give us a glimpse of his superhero identity - the Patriot. But don't expect every secret to be revealed in that episode - episode 14 will be entitled "The Man Behind The Shield". This hints that Mace may go one step further, and become the new (albeit likely shortlived) Captain America. But his mystery won't be resolved until that later episode. Agents of S.H.I.E.L.D. has taken a slow-burn approach with the character of Jeffrey Mace. Marvel drew out the revelation of his identity until the second episode, "Meet the New Boss," and has deliberately teased that Mace's story will be one of the defining arcs of Season 4. With fans focused on how Season 4 is changing in the aftermath of the mid-season break, it's nice to see some continuity. Read next: How Will Thor And Loki React To 'Captain America: Civil War'? Will the 87th Academy Awards Top Last Year's Bizarre Moments?